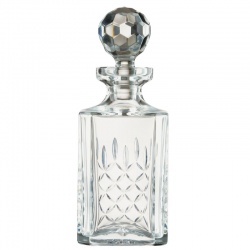 An engraved crystal decanter is traditionally presented as a commemorative gift or award, as retirement gifts, or as a recognition award. This selection of fine quality cut glass decanters and lead crystal decanters is suitable for the most prestigious presentation. 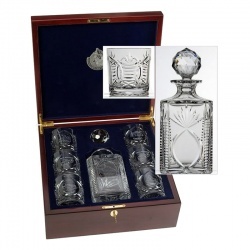 Choose from spirit decanters, wine decanters, whisky decanters and brandy decanters, all offered with low, fixed-cost text engraving and free logo engraving. 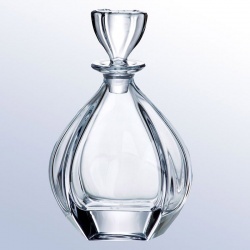 Non-lead crystal spirit decanter in curved design. Supplied boxed. 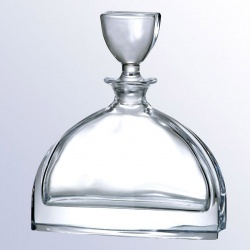 Crystal Full Cut Square Decanter on Optional Recessed Base. Silver tone finish. Classic 'Chippendale' styling. Sturdy linked chain. 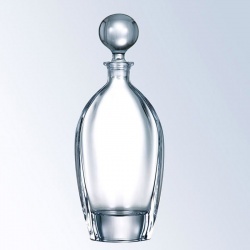 Non-lead crystal decanter in teardrop shape. Supplied boxed. 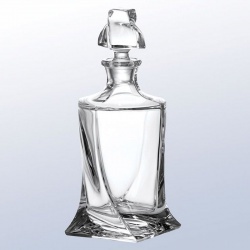 Non-lead crystal decanter in stylish twisted square shape. Supplied boxed. 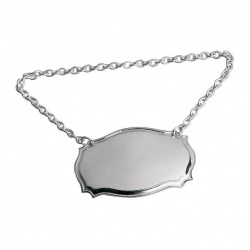 Non-lead crystal decanter in half-moon design. Supplied boxed.